What is the story behind the missing Horsefish? Okay, so this has been bothering me for many years. Cecil the Horsefish is not found in any of the levels of this game. Does anyone know what is the story behind that? It looks like a friendly animal, so I am assuming that it was much like that yellow octupus and the big whale? I don't know much about editing a game or seeing the sprites. What I am asking is, is there a secret level or something? I would like to find out if there is one. I don't think there is a story or a secret level as far as I know. I'm guessing they must have completely forgot I add Cecil as they were designing the levels. Using a cheat engine I managed to find all the levels, and sadly there is so secret level. I will continue to play around with the codes. Maybe I will discover something. Re: What is the story behind the missing Horsefish? I don't recall the Octopus being helpful I the 16 bit version, could you stand on him in the same way you could with the whale? 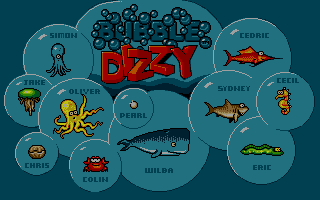 I remember in the C64 there was a Jelly fish or some such which you could ride on for a short period of time. Maybe it appears of on of the many ports?